Mark L. Prophet was a man of tremendous spiritual mastery, yet profoundly human. In Memories of Mark, Annice Booth, his friend and student, shows us both the magic and the mystery of this visionary pioneer of modern religious thought. This is a page-turner about the life and times of a spiritual man, a true story, which is able to enrich anyone's thought beyond the deceptive limits of material life. Mark prophet shows all the signs of a spiritual person who, at times and with the elementals' and masters' aid, was able to positively impact and control the weather, drive his car through a wall without a scratch, precipitate food, water, and money, and other demonstrations of dominion yet the man is practical, unassuming, and down to earth. 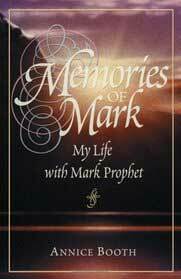 Buy Memories of Mark - My Life With Mark Prophet by Annice Booth at Amazon! Copyright © Summit Publications, Inc. All Rights Reserved.